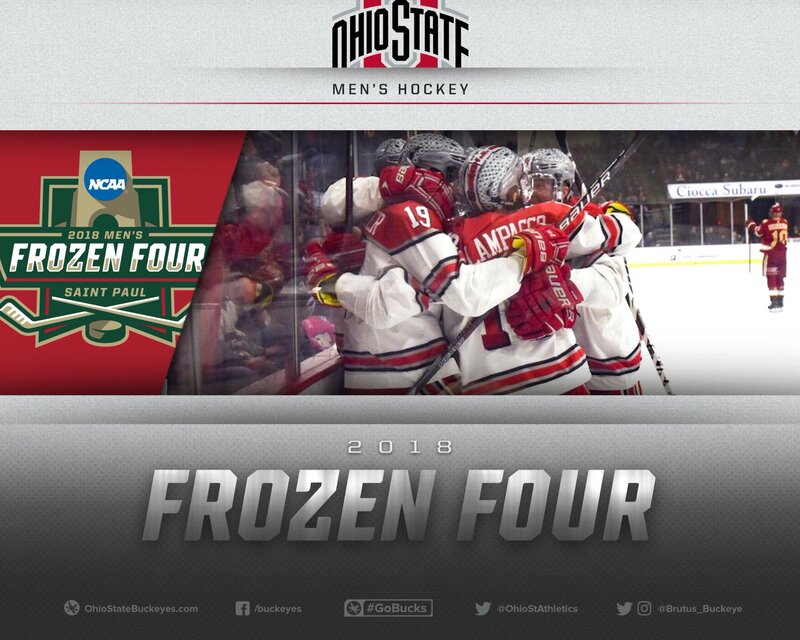 Ohio State defeated defending NCAA Champion Denver 5-1 in the Midwest Regional final on Sunday in Allentown, Pa., to advance to the NCAA Frozen Four for just second time in program history. The Buckeyes will take on Minnesota Duluth on Thursday, April 5 in St. Paul, Minn.
Four Buckeyes were named to the Midwest Regional All-Tournament Team led by Most Outstanding Player Sean Romeo. He was joined by forwards Dakota Joshua and Tanner Laczynski as well as defenseman Sasha Larocque. A limited number of All Session passes will be available for purchase to Ohio State men’s hockey season ticket holders and PSL holders through the Ohio State Athletics Ticket Office. p.m. ET on Tuesday, March 27 to be considered. If tickets are still available in the Ohio State allotment after all priority requests have been received, tickets will go on sale to the general public beginning Wednesday March 28, 2018 at 10 a.m. online only at www.ohiostatebuckeyes.com/tickets. Those with questions may contact the Ohio State Athletics Ticket Office at 1-800-GO-BUCKS.